Learn to sew two pairs of chic, smart, perfectly-fitting trousers in our Advanced Guide to Sewing & Fitting Trousers online class! With video tutorials, illustrated step-by-step instructions and a selection of in-depth technique guides, we help you take your trouser-making skills up a notch or two. At the end of the course not only will you have two fantastic pairs of completed trousers, but also the skills and confidence to go forth and try out lots of different patterns and designs. Designed for intermediate sewers looking to build their technical skills, our Advanced Guide to Sewing & Fitting Trousers will introduce you to zip fly closures, welt pockets and curved waistbands – and show you how to get flawless results every time. 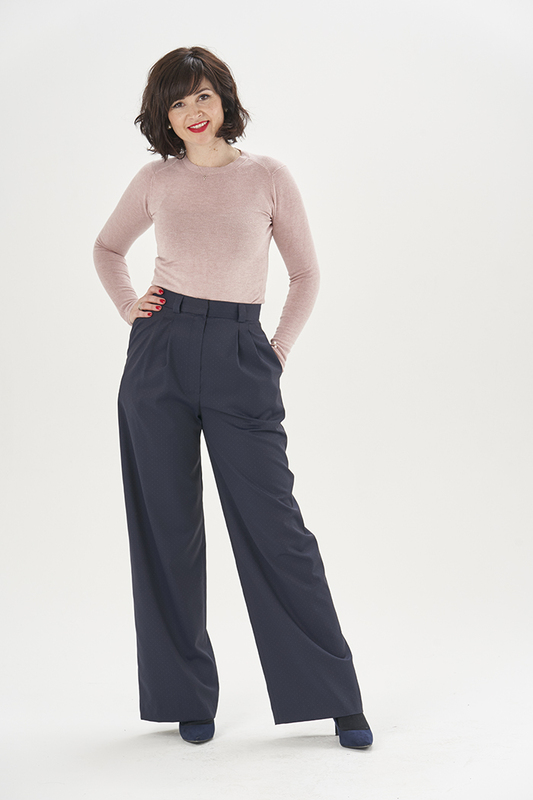 The Nina Trousers are a beautifully classic pair of wide-legged trousers. With their high, fitted waist they have a slight vintage feel, but made in a bold, swishy fabric they are equally on-trend and contemporary. Whether you’re working hard at the office, or relaxing on a summery city break, the Nina Trousers are versatile, fun to style and a true wardrobe workhorse. Designed to sit on the natural waist, the Nina Trousers feature a straight waistband with a zip fly opening. The waist is shaped with pleats at the front, and double darts at the back. They have in-seam pockets and belt loops along the waistband. The legs fall from the hip for a lovely wide, floaty feel. Inspired by the iconic wardrobe of Audrey Hepburn, the Cigarette Pants are a chic, sleek pair of trousers. Perfect for the office, they are smart and sophisticated, looking great paired with your collection of handmade blouses or breton tops. The Cigarette Pants feature a zip fly, with a flat front and slanted pockets. Sitting on the high hip, they have a curved waistband and are fitted at the back with darts. The leg is gently tapered, finishing at the ankle for that classic Audrey look. For both the Nina Trousers and Cigarette Pants, we recommend using a medium weight woven fabric with drape. Our rio and triple crepes are perfect if you want a plain pair of trousers, but you can also branch out into suitings and lightweight wools. For the Nina Trousers you have the option of using a lighter weight crepe to give you swishy, floatier feel. Browse our specially curated fabric collections for the Nina Trousers and the Cigarette Pants in our fabric shop. Why do an online sewing class? The Advanced Guide to Sewing & Fitting Trousers online class is a friendly yet thorough introduction to the world of advanced trouser-making, available for you to access at any time of day or night! The class is available 24/7 so you can fit your sewing around your busy schedule. There’s no need to start the course straight away. You have lifetime access so whenever you’re ready to begin, the course will be there for you. With the option to dip in and out of the class as you like, you can learn at your own pace. Rewind as many times as you like! The Advanced Guide to Sewing & Fitting Trousers online class is aimed at intermediate level dressmakers who want to take their trouser-sewing skills up a notch. We recommend you’ve had a go at a simple pair of trousers before, such as the Carrie Trousers. You should also be able to insert a zip. We’ll talk you through the construction of both pairs of trousers, and if it’s the fit you want to master, we’ve got you covered there too with a comprehensive series of PDF fitting guides. Both the Nina Trousers and Cigarette Pants are available in UK sizes 8-20. See the sizing charts (pictured) for measurements, plus details of fabric and notion requirements.